Vertical Booking’s central reservation office (CRS) software makes it possible to manage telephone reservations for a large number of hotels. The Vertical Booking central reservation system includes a very sophisticated application for managing one or more central reservation offices. Hotels or chains may manage their own voice reservation call center with this user-friendly call center reservation software. 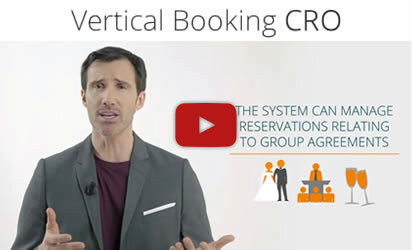 Vertical Booking’s central reservation office (CRO) software makes it possible to manage telephone reservations and requests for quotations for a large number of hotels, suitable for a large call center. All calls are monitored and both the yield and conversions are tracked. Through the software, direct reservations can be made, existing reservations can be changed or canceled, or quotations can be created. Quotations can also be sent via email or text, the rate can be fixed and the room can be blocked for a certain number of days. Comparisons and multiple reservations can be made between various hotels in a chain with the shopping basket feature. New and returning customers can be managed, as well as those who are part of loyalty programs.